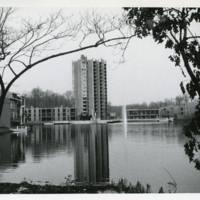 Photograph [undated] of Washington Plaza, Lake Anne Village, Reston, Va. while under construction. 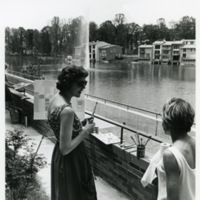 Two artists standing on the south side of Lake Anne confer with one another while a third paints. 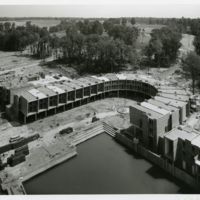 Photograph showing rear of several Waterview Cluster townhomes in the foreground and Heron House in the background at left. 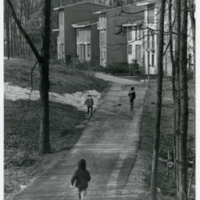 Photograph showing a walking trail leading up to the front of several townhouse units belonging to the Waterview Cluster in Lake Anne Village. There are three individuals using the trail in this photograph. 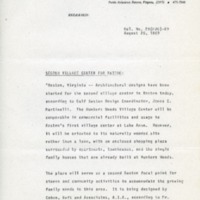 Photostatic reproduction of a news release of August 20, 1969 announcing the release of the plans for the Hunter's Woods Village Center in the southwestern part of Reston. 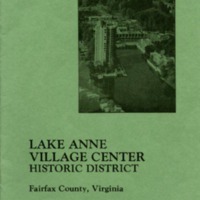 Plat showing layout of housing clusters, single family homes, model homes, schools, churches, and roads in Lake Anne Village. That high-rise building is a symbol. There is going to be a city here. 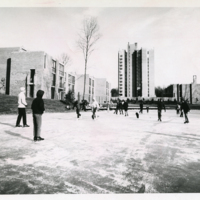 Photograph of Skaters on the north western part of Lake Anne in winter. 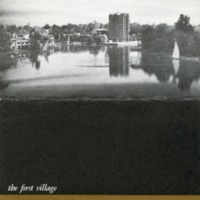 Heron House can be seen in the center and on the left, the Whittlesey and Conklin townhouses of West Washington Square. 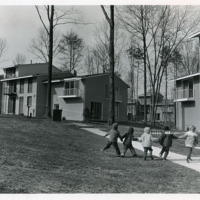 Five children play at the rear of a town house cluster in Lake Anne Village. Also in photograph is a dalmatian dog. 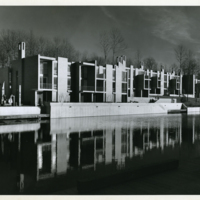 Photograph showing several units of the Hickory Cluster town homes designed by architect Charles Goodman. In the foreground is a children's play area. 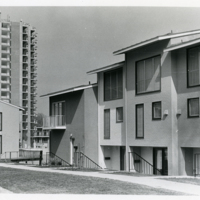 Photograph showing several units of the Whittlesey and Conklin town houses along the south side of Lake Anne. 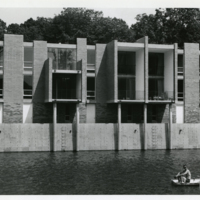 Photograph showing several units of the Whittlesey and Conklin townhouses along the south side of Lake Anne. 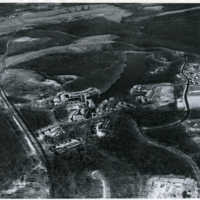 Aerial photograph of Lake Anne Village as seen from the west. 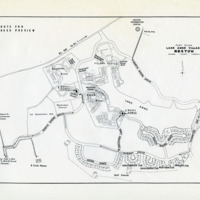 Visible in this photograph are: Lake Anne and Washington Plaza, Heron House, Waterview and Hickory town home clusters, Baron Cameron Avenue, and North Shore and Fairway Drives. 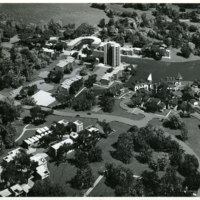 Aerial photograph of Lake Anne Village, approximately 1965. 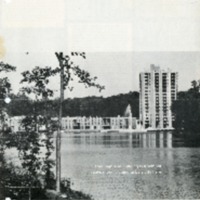 This view is from the west looking east with Lake Anne, Lake Anne Plaza and the Heron House apartment tower in the center of the image. 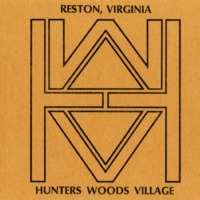 Booklet describing the future Hunters Woods Village Center. 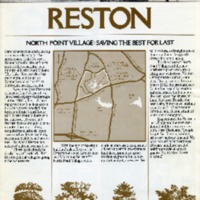 The booklet contains general information about Reston, as well as detailed information about the then-planned Hunters Woods Village Center. 15 pages. 35 mm color slide of Hunters Woods Village Center drawing. 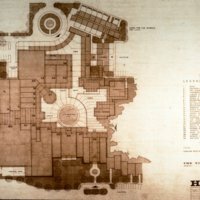 This image is a plan for the Hunter Woods Village Center. Image shows placement and arrangement of shops and offices and landscape design features from an overhead perspective. 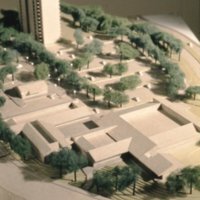 35 mm color slide of Hunters Woods Village Center architectural model. 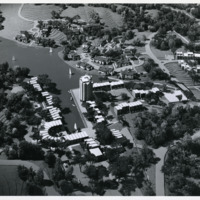 shows placement and arrangement of shops and offices, landscape design, and housing features from an overhead perspective. 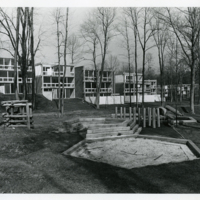 Slide is dated January 1970, 1 3/8" x 15/16", color. 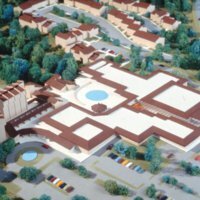 35 mm color slide of Hunters Woods Village Center architectural model. shows placement and arrangement of shops and offices, parking, landscape design, and high rise housing. features from an overhead perspective. 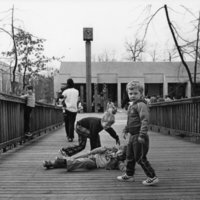 Photograph showing children playing on a wooden bridge at Tall Oaks Village Center. Behind them are the Village Center buildings and sculpture pieces.